Once you've uploaded your theme, it's time to make it your own. 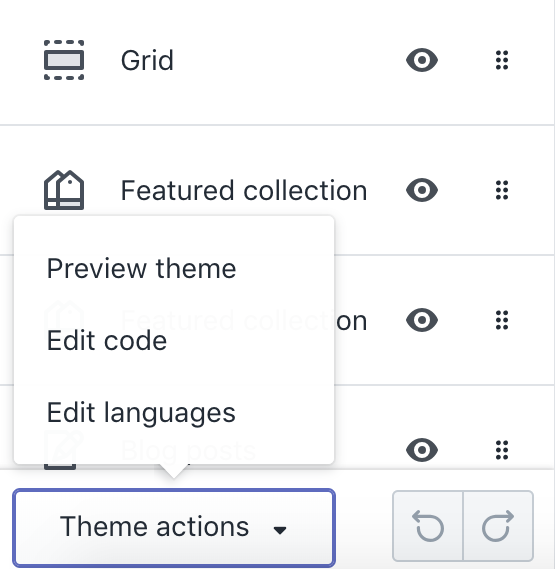 While all of your products, collections, pages, and navigation are configured in the Shopify admin, any changes you make to the look and feel of your store happens in the theme editor. Access it by navigating to Online Store > Themes and then click the purple Customize button. The theme editor is divided into two tabs: Sections and Theme settings. We'll cover each in detail below. 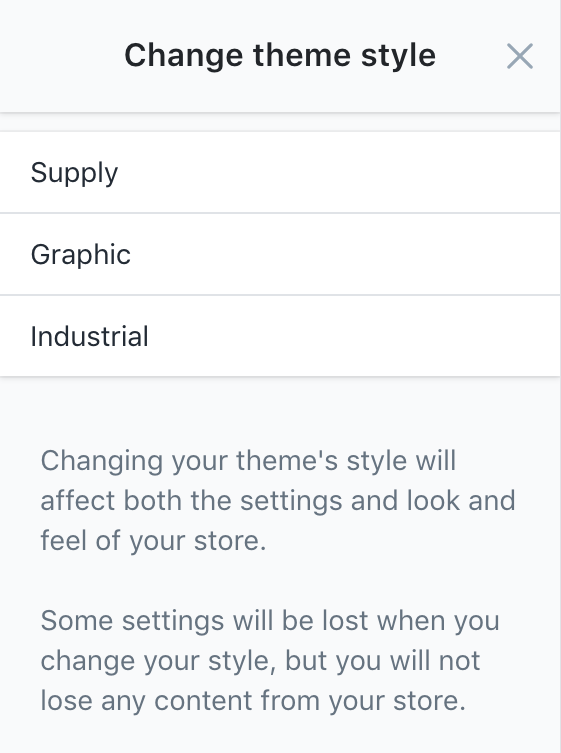 The Theme settings tab lets you make global changes to the look of your store, including colors, typography, and products, as well as links to your social media accounts. Most of the time you spend in the theme editor will be on either the Sections or Theme settings pages. There are, however, a few lesser-known areas and shortcuts that can be super helpful as you're building your store. The Theme actions menu at the bottom of the settings bar contains a bunch of handy links. Edit languages lets you both change the language of your theme and Checkout page, and customize the wording that is used throughout your store. On the right side preview's top bar, there are three buttons that let you toggle between previewing your site look on mobile, desktop, and expanded desktop. Empire comes packaged with three different theme styles that curate your store's colors, fonts, and styles for you. Check out our store demos to see the Industrial, Graphic, and Supply styles in action. To select the theme style you would like to use in your store, click over to the Theme settings tab, then scroll all the way to the bottom to the Change theme style button. Here you can preview the theme styles and select the one that's right for your store.